Several of the chapters in this book actively seek to question the boundaries of what counts as a ‘protest camp’. The Greenham Common Women’s Peace Camp clearly fits within commonly accepted understandings of a protest camp – it was a long-term, site-specific protest where people lived, congregated and took action together. On the other hand, one of the other most iconic long-term protests to take place in England in the 1980s is not so simply defined as a ‘protest camp’. For nearly four years, from 19 April 1986 until February 1990, anti-apartheid solidarity activists organised by the City of London Anti-Apartheid Group maintained a continuous protest outside the South African embassy in London. Despite being a continuous, long-term protest, nobody lived or slept outside the South African embassy. The protest’s physical infrastructure consisted of little more than a fabric banner (in later years, engineered so that it could be freestanding) and a few crates of equipment (that doubled up as seats, occasionally). The Non-Stop Picket demanded the unconditional release of Nelson Mandela and all political prisoners in South Africa, as well as calling for Britain to sever all political, economic, and cultural links with South Africa while apartheid existed. Positioned on the pavement directly in front of the main entrance to the embassy, the Non-Stop Picket was strategically located to draw attention to (and cause maximum embarrassment to) the apartheid regime’s representatives in Britain (Brown and Yaffe 2013; 2014). The modest infrastructure of the Non-Stop Picket looked fragile against the large stone edifice of South Africa House, but it proved to be remarkably resilient. The Picket was a constant irritant to the ‘peace and dignity’ of South Africa’s diplomatic mission; and successfully resisted every attempt that was made to remove it (Brown 2013). With its ephemeral infrastructures, The Picket was able to never the less create a substantial antagonism to the Apartheid state and also enacted a transnational politics of solidarity with comparable protests taking places in front of South African embassies around the world (Metz 1986). 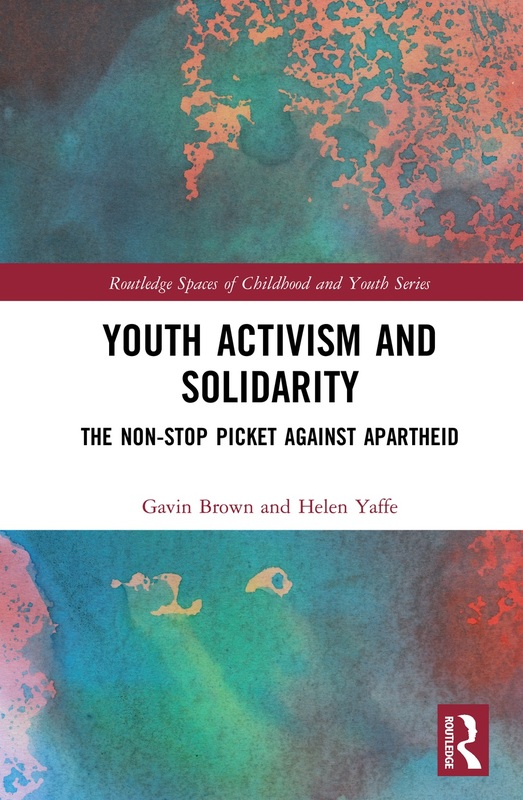 Gavin Brown and Helen Yaffe’s book Youth Activism and Solidarity: the Non-Stop Picket against Apartheid was published, by Routledge, in October. Their book tells the story of the Non-Stop Picket and the experiences and motivations of the (mostly) young people from London and across the world who were inspired to build a direct action-based anti-apartheid solidarity movement in Britain. Their book is simultaneously a history of a particular moment in British anti-apartheid activism; a study in the spatiality of solidarity and contentious protest; and a study of the place of young people in those social movements and in the urban landscape of London in the 1980s. The book offers new insights to the study of social movements and young people’s lives. It theorizes solidarity and the processes of adolescent development as social practices to provide a theoretically-informed, argument-led analysis of how young activists build and practice solidarity. A full outline of the book can be found here. When City Group ceased to operate at the end of apartheid, some of the remaining members of the Group made plans to preserve the Group’s archive with a view to publishing their story. That publication never happened, but Gavin and Helen benefited from the decision to preserve a record of their anti-apartheid campaigning. They were lucky enough to be granted privileged access to this privately held archive. In addition to the Group’s correspondence, minutes of their meetings, membership records, and publicity material, there were witness statements from court cases, banners, and hundreds of photographs. The book is currently only published in hardback and retails for £105 (academic publishers tend to target the institutional library market first). However, if you order it through the Routledge website, you can use the discount code FLR40 to obtain a 20% discount. A more affordable paperback edition will be published next year. In the meantime, if you are in a position to order or request a copy for your school, university, or local community library, Gavin and Helen would appreciate your help in bringing the book to a wider audience. This entry was posted in protest camps and tagged academic, anti-apartheid protest, City of London Anti-Apartheid Group. Bookmark the permalink.